This round comes from one of the most uniquely patterned and best shaped Hubbard Basin logs I’ve personally ever seen. I hope you’ll look past all those crazy reflections in the mirror polished agate face – those dark colors are tough to photograph in such a long piece without getting mirror effects from the beautiful polish! Everything about it is as unusual as it is beautiful including one of the most dramatic color displays I’ve seen in any petrified wood! The blue in this piece is as rich as any petrified wood can get! Perhaps best of all is the amazing wood grain from the rind to the heart of this ancient spruce tree, all revealed in perfect detail with our signature mirror polish! It’s going to make a gorgeous addition to some lucky new owner’s collection – here’s hoping it’s yours! Here’s an absolutely gorgeous, flawless petrified wood round from one of the most prized petrified wood deposits ever discovered! If you aren’t familiar with the Hubbard Basin petrified wood from Nevada, you should be! It’s a very colorful variety, though true collectible pieces from this location are not plentiful. This piece has all of the best colors that these coveted specimens are famous for in a lighter pattern that makes this one unique even in an advanced collection. The characteristic blue, white, black and gold along with a lot of other colors appear to have been painted into the stone with the single intention of drawing a gasp from the fossil wood collector on sight! The shape, color and wood preservation are all far better than most Hubbards and the crystal pockets hidden in the face are an added bonus. Besides being beautifully colored, it’s also perfectly preserved. The flowing wood grain from this complete round starts at the heart and forms massive arcs through every region of this highly colorful wood. The cells are uncommonly well preserved for Hubbard Basin wood with virtually every colorful region showing excellent wood grain preservation right down to the ray cells within the growth rings! The detail in the lighter regions is washed out in the photo, but it’s easily visible in the actual stone. Hubbard Basin petrified wood is highly prized among fossil and gemstone collectors because of it’s uniquely beautiful blue color and gold, red, etc. It’s also some of the best agatized wood to be found and is sometimes even translucent. Wood is relatively scarce from this region and true collector pieces are very seldom encountered. The qualities that make a piece valuable are color, completeness, shape and fracture free – this piece has them all and several dozen open crystal cavities to boot! 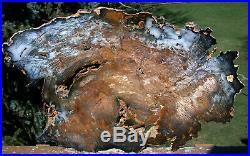 This is an extra large log cross section of petrified wood. This round is complete, and nicely sized although most of these specimens were from softer wood species and like their cousins in Cherry Creek (Nevada’s other famous deposit) they tended to get “squashed” in the ground forming oblong rounds when cut. This one is a conifer of some variety (probably spruce). We work hard to find the best specimens from the most prized locations and then work with our magic to create a world class specimen for your collection. Our shop is unmatched in both the techniques and attention to detail to produce the finest petrified wood specimens available anywhere. Our work stands above that of the commercial vendors simply because we take the time to make each piece something we’d keep in our own collections which means you’ll be treated to a lustrous polish that still looks wet to the touch when you see this true collector gem! The piece is quite solid and meant to be handled. A quick squirt of windex will remove fingerprints from the glassy polished surface. This stone has been professionally cut and polished on a special lap that produces a flat face and a mirror perfect shine. The polish really is liquid perfect – a difference in the quality products Sticks-in-Stones has built its reputation on that others can only aspire to! It measures about 15 1/2 wide across the mirror polished face. It’s cut about 3/4 thick. Weight is about 7.00 lbs. It’s very solid agate and just about as good as you can ever hope to see in petrified wood! The item “SiS PHENOMENAL 15+ Hubbard Basin Petrified Wood Round TRULY MUSUEUM GRADE” is in sale since Sunday, March 10, 2019. This item is in the category “Collectibles\Rocks, Fossils & Minerals\Fossils\Vegetation\Petrified Wood”. The seller is “rockshop” and is located in Beaverton, Oregon. This item can be shipped worldwide.